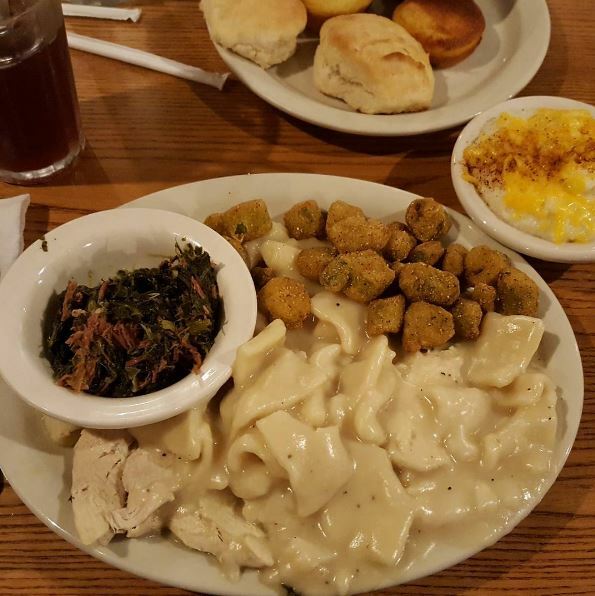 The Cracker Barrel is a place you can’t go to unless you’re absolutely starving. Normally, I have an aversion to visiting chain restaurants while on vacation. However, it seemed like the right place and right time to check this place out. People have raved about it for years. Every time I have ever passed, the parking lot is full and people are waiting outside. One glance at the menu and its prices and you will realize why. This is down-home, artery-clogging southern cooking. With items such as a chicken-fried steak, classic fried chicken and fish dishes, and buttery biscuits, this is not a place you want to visit if you are watching your waistline. Hell, your cholesterol might go up just sitting in the parking lot before you even go inside. I decided to go with a “healthier” option of chicken and dumplings. This classic dish came served with three sides and complimentary biscuits and corn bread. I’ve never had this before and was interested to try. They claim homemade dumplings and the stock it all gets cooked in. The chicken was juicy and tender, while the dumplings themselves were soft and chewy, but in a good way. The sauce was rich and flavorful. Surprisingly, it was not salty at all. The three sides I chose were fried okra, turnip greens, and cheesy grits. The okra was excellent, the greens seemed to be canned but were cooked with pork and tasted pretty good, but the grits were downright terrible. Atop the layer of cheese they seemed to have sprinkled some kind of seasoning which tasted like Old Bay. Whatever it was just did not work. It was disgusting. Thankfully, the rest of the meal was so good (and huge enough) that it did not matter. And those biscuits? Damn. I could have eaten a whole basket by myself. The price for this feast? Only $9.39. Most meals fell near this price. I think the most expensive thing on the menu did not even eclipse $11. My friend had a fried shrimp platter which also came with three sides, and was only a dollar more. In a tourist area becoming increasingly expensive, there is no wonder why the place is always packed. If you’re travelling with a large family, you can’t go wrong with breakfast or dinner here. It’s just too affordable to pass up. I actually wonder how they even make money, but I guess the sheer quantity they put out has something to do with that. Even desserts were dirt cheap. In New Jersey, you’re looking at minimum $6 for a slice of cake or ice cream sundae. 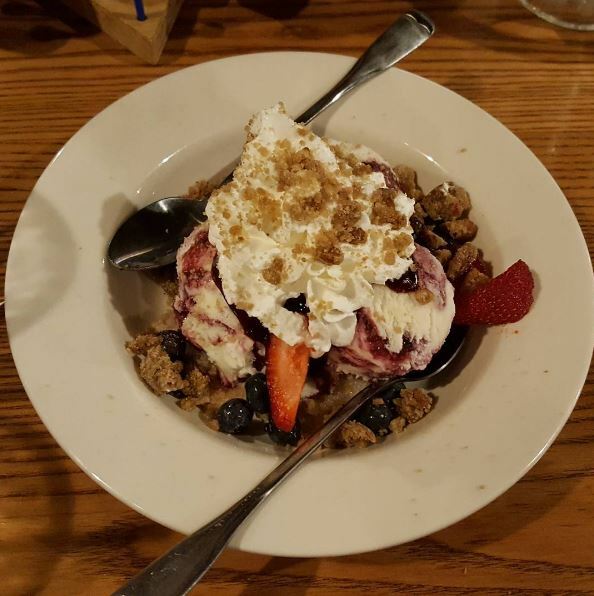 We had the wild berry cobbler ($3.99) which came topped with pecan streusel crumbles. This portion size was also gigantic, plus the strawberries and blueberries were fresh. I wasn’t too hungry when I arrived, so getting through this was tough. I gave it my best shot, though. I couldn’t even finish the meal and sides, there was just too great a portion. I am going to give Cracker Barrel of Lancaster a 3.5 out of 5 stars for affordability, quality for a chain restaurant, and friendly service. If only the grits weren’t so nasty, perhaps I would have upped the grade a little bit. I would definitely come here again, but not for a while. This is the kind of place you need to take in stride. Like a once-a-trip visit. This review was originally posted here. The Cracker Barrel is located at 35 South Willowdale Drive in Lancaster, Pennsylvania.